Did anyone ever have a hankering for Belle’s Magical World, the third project in the Beauty and the Beast series? Probably, but I can’t say I entered into it with high expectations. I very much enjoyed the original flick from 1991, but its first direct to video (DTV) sequel in 1997 seemed extremely lackluster. Still, I try to maintain an open mind when it comes to Disney’s product, so I attempted to go into World without too many negative prejudices. As with Cinderella II: Dreams Come True and Tarzan & Jane, World doesn’t provide one coherent narrative. Instead, it cobbles together four different segments connected by a vague theme. In this case, we see stories that deal with misunderstandings and forgiveness. “The Perfect Word” launches the program. Belle (Paige O’Hara) and the Beast (Robby Benson) offend each other during dinner, but neither will apologize first. La Plume the pen, Webster the dictionary and Crane the stationery write a letter of apology for the Beast and sign it in his name. They reconcile after she receives it but matters soon worsen when he learns of this forgery. In “Fifi’s Folly”, the fifth anniversary of Fifi’s (Kimmy Robertson) first date with Lumiere (Jerry Orbach) approaches. She feels excited, but he forgets it until he receives a reminder. Lumiere then actively tries to make it a special date, and Belle helps him. Unfortunately, Fifi overhears their efforts, and she mistakenly believes that Lumiere has the hots for Belle. Fifi attempts to sabotage his romantic efforts as she believes they’re meant for Belle. Some gloomy weather causes Mrs. Potts (Anne Rogers) to feel depressed at the start of “Mrs. Potts’ Party”. At the urging of the others, she gets some rest, and Belle enlists the gang to throw a surprise party to cheer up the mopey teapot. Unfortunately, arguments mar the plans, as different folks maintain varying concepts about how to do things. Finally, “Broken Wing” finds a new visitor to the castle. A little bird gets injured, so Belle cares for him despite warnings from the staff that the Beast hates to see animals in the castle. In the meantime, the Beast plans an elaborate lunch for Belle with the aid of Cogsworth (David Ogden Stiers). The Beast discovers the bird when Belle misses the lunch as she cares for the critter, and he ain’t happy. In addition, Cogsworth cheeses off the others with his tyrannical execution of the luncheon. Created by Disney’s TV animation division, World feels like a collection of episodes created for a series that – as far as I can tell – never hit the small screen. I thought World offered newer product, but as it happens, it actually debuted in 1997, the same year that brought us Enchanted Christmas. Hmm… maybe that means World is truly the second part of the trilogy and Christmas ends it! Not that either of the Beast sequels attempt to carry the first film’s story past its conclusion. Both take place in some alternate universe that occurs during the action of Beast. That means the Beast is still the Beast and not his human self. Since flicks like Tarzan and Jane and Cinderella II showed us what happened after happily ever after and the answer was “not much”, I can’t say the decision to set World in the middle of the film’s story comes as a big disappointment. I also can’t claim that the quality of World really let me down either, for that would imply I had high expectations. I didn’t anticipate much, but even so, World fell short of what I thought I’d get. Even as bland and lifeless as it was, Enchanted Christmas came across as vastly superior to this dreck. At least Christmas included all the available original castmembers. World loses Angela Lansbury as Mrs. Potts, and Benson’s Beast is MIA part of the time; he really only appears in the first and final episodes. Given that both programs were completed in the same time frame, it seems like a surprise that Lansbury did one but not the other. Maybe she read the script - or the ramblings on the back of a diner napkin that apparently passed for a script. The stories show no sense of invention, creativity or personality. They all deliver vague morals but never remotely create any level of interest in the viewer. The drama’s hackneyed, the comedy’s unfunny, and the action’s bland. And the animation’s even worse! I don’t expect feature-quality work from DTV efforts, though some come pretty close; for example, the generally solid 101 Dalmatians II: Patch’s London Adventure boasts fairly pleasant art. Not so in the case of the shoddy and tacky World. The animation seems choppy and imprecise, and some of the character drawings look atrocious. Belle looks truly cartoony, and many of the characters display weird shapes such as Mrs. Potts’ occasionally oblong eyes. Absolutely no care or effort appears to have gone into this ugly and cheesy piece of work. The new characters such as Webster and La Plume display no distinct personalities, and the two – count ‘em! two! – new songs are bland beyond belief. Belle’s Magical World exists as nothing more than cheap animated product. I don’t know if it’s the worst Disney direct to video program I’ve seen, but it’s got to be close to the bottom of that pile. 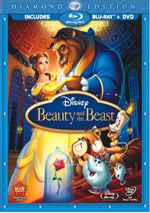 Beauty and the Beast: Belle’s Magical World appears in an aspect ratio of 1.33:1 on this single-sided, double-layered DVD; due to those dimensions, the image has NOT been enhanced for 16X9 televisions. Disney usually provides terrific visuals for their animated products, but World differed from that trend, as it suffered from a very bland presentation. Sharpness seemed erratic. Much of the movie looked reasonably accurate and well defined, but plenty of soft images appeared as well. The inconsistency existed with no apparent pattern, as softness affected close-ups as well as long shots. Some light examples of jagged edges and moiré effects showed up as well, and I noticed a smidgen of edge enhancement. Given the age of this material, I expected virtually no source flaws. Unfortunately, World suffered from quite a few of them. The material exhibited a generally dusty look, and artifacts gave it a grainy feel. In addition, the program showed some specks and marks. While some of those appeared to come from weak clean-up animation, plenty of additional defects appeared. Colors generally came across as decent but unexceptional. At times the hues seemed somewhat flat and runny, but they usually manifested acceptable tones. Nothing about them appeared particularly rich or lively, but they only occasionally dropped to subpar levels. Black levels were reasonably deep and dark, and shadow detail seemed adequately dense and opaque, but neither stood out as especially strong. 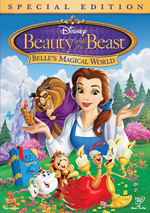 Belle’s Magical World consistently remained watchable, but the mix of issues appeared surprisingly problematic given Disney’s record of good DVD transfers. The Dolby Digital 5.1 soundtrack of Belle’s Magical World displayed few overt flaws, but it suffered from the project’s lack of care and ambition. The mix maintained a very heavy emphasis on the forward channels. Music showed nice stereo spread, and occasionally I heard cleanly localized effects in that domain. Those elements meshed together well and moved smoothly from channel to channel. As for the surrounds, they contributed virtually nothing more than general ambience. The rear speakers reinforced the music and effects but seemed to add nothing unique. Audio quality appeared acceptable but not terribly positive. Speech came across as poorly integrated. Much of the dialogue demonstrated excessive reverb, and that made the lines blend into the movie badly; it really reminded me that all the actors were recorded separately, and it became a distraction. The speech sounded intelligible and lacked edginess, but the artificial qualities caused some concerns. Music seemed a bit too bright most of the time. The score demonstrated some decent low-end response on occasion and usually sounded fairly good, but those elements occasionally appeared slightly too harsh and tinny. Effects came across as clean and accurate, and they demonstrated the best bass response on display in the film. From the Beast’s roar to the slamming of a door to thunder, the low-end elements didn’t appear terrific, but they remained good. Overall, the audio of Belle’s Magical World lacked anything much to make it stand out from the crowd, but it seemed mostly acceptable for this sort of effort. How does this 2011 release compare with the original DVD from 2003? I thought both were virtually identical; if Disney did anything to improve the prior release’s presentation, I couldn’t discern the changes. 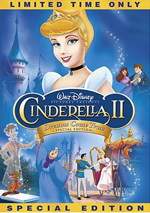 In a confusing move, Disney entitled both the 2003 DVD and the 2011 release “Special Editions”. 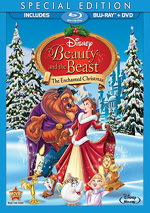 The 2011 disc includes the same extras plus one new addition: Disney’s Sing Me a Story with Belle. This runs 22 minutes, 58 seconds and presents an episode of a mid-1990s Disney Channel series that mixed live action, puppets and animation. Belle (Lynsey McLeod) tells stories and sings tunes that support the notion that “What’s Inside Counts”. It’s interesting to see out of curiosity, but it’s not a particularly good program. Everything else repeats from the 2003 disc. The DVD folks at Disney love their games, so World tosses in the Belle’s Delightful Dinner Game. First this requires you to find three characters somewhere in the mansion, and then you need to answer eight questions to light Chandeliera’s candles. These tasks seem very easy and fairly pointless. It ends without any substantial reward. If you’ve seen those video programs that show nature scenery, you’ll know what to expect from Enchanted Environment. This provides animated footage of the forest and also lets you choose to listen to music, sound effects, or music and sound effects. It’s inconsequential but kind of cute. Disney’s Song Selection basically acts as an alternate form of chapter menu. It lets you jump to either of the film’s two song performances, and it also allows you to show on-screen lyrics. Yawn. The DVD opens with ads for Lady and the Tramp, Brave, and Treasure Buddies. These also appear under Sneak Peeks along with promos for Disney Movie Rewards, Disney parks, Prep and Landing, Cinderella, Secret of the Wings and Beauty and the Beast: The Enchanted Christmas. There may be another Disney “direct to video” effort worse than Beauty and the Beast: Belle’s Magical World, but I can’t think of one. This clunker suffers from terrible animation and art, dull stories, and no reason to exist other than to sell some product. The DVD suffers from surprisingly dirty and flawed picture along with adequate sound and an insultingly small roster of extras for an alleged “Special Edition”. Even if you or someone in your household loves Disney and Beauty and the Beast, skip this atrocious piece of junk.